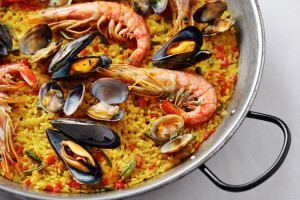 Check Out Some Mouth-Watering Spanish Cuisine Before you Take Off! Familiarizing yourself with popular local cuisine will help you explore your options while exploring Spain! Get ready to spice up those tasty tapas and steaming paella while exploring Spain with us this summer. With a rich history, colorful flavor combinations, and exotic ingredients Spanish cuisine will have you coming back for more. Join us on this week’s journey as we waltz through the local farmer’s markets on cobblestone streets bringing you the local must-trys from overseas. Let’s begin! A wonderfully thick, chilled tomato-based soup, Gazpacho is a Spanish classic. Incorporating fresh olive oil, chopped garlic, bell peppers, cucumbers and bread blended into an enticingly smooth consistency, Gazpacho is extremely popular amongst locals in the summer. With a jug of this refreshing soup conveniently in every tapa bar, it won’t be hard to spot this must-have and give it a try. A traditional Spanish rice dish, Paella is the most extremely versatile and well-known. In the Valencia region, locals claim you can eat a different rice dish every day of the year. Using rabbit, chicken, saffron, butter beans, and runner beans this authentic cuisine may also incorporate a variety of different shellfish as well. The rice acts as a flavor combination hub, absorbing all the rich savory combination left at the bottom of your bowl. From start to finish, this Spanish dish will leave you wanting more with each bite! Similar to a Spanish omelet or quiche, Tortilla Espanola is a combination of eggs, potatoes, and onion. The onions and potatoes are slow-roasted then added to the beaten eggs in order to combine flavors before the cooking process. Some Spaniards will add chorizo, ham, spinach, or courgettes to create enticing flavor combinations. An authentic prawn dish, Gamba al ajillo is sliced garlic, green chili, olive oil, and parsley thrown together in a steaming dish of alluring aroma. Never had prawns before? They are essentially the Spanish version of shrimp, looking, tasting, and smelling almost exactly the same. Wholesome cubes of potato combined with a sweet and spicy pimenton sauce incorporating paprika, olive oil, flour and stock, patatas bravas is amongst the most ubiquitous of Spanish tapas. Often made at home, this dish has a never-ending list of offshoot recipes based on family ties. Everyone has their own patatas bravas which makes trying this dish again, and again, and again exciting and adventurous every time. A roast suckling pig or lamb, this piece of meat is cooked in a huge firewood oven until it is so tender it can be sliced with the side of a plate. The soft slices of medium rare meats will melt in your mouth as you take bite after bite after bite. Dive into Spanish Culture This Summer ! Check Out AESU Today! This entry was posted on Wednesday, June 1st, 2016	at 11:45 am	. You can follow any responses to this entry through the RSS 2.0	feed. Both comments and pings are currently closed.